The first benefit is that untill now , a recognized startup entity could claim tax deduction for 3 consecutive years out of 5 years begining from year in which such eligible startups is incorporated. Now this was problemetic for amny as startups take some time to start earning proifts ,,,,,,so claiming deduction for profits within first five years was a non-starter for many. 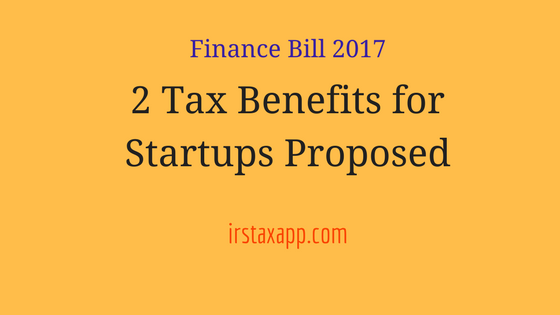 The Finance Bill 2017 now proposes to amend the section 80-IAC of the Income Tax Act to allow startups to claim deduction for 3 consecutive years out of block of 7 ( seven ) assessment years. The amendment is effecive from assessment year 2018-19. As per the Section 79 of Income Tax Act , a closely held company ( private limited company) is not allowed to carry forward losses and set off in a year in which the shareholders change shoareholding by 51 % . In other words , for example , if a private limited company is carrying losses of 1 crores for three years in its tax return. As per I.T.Act , the business loss can be carried for 8 years ( depreciation loss for infinity) and can be used to set off the gains on business. Now , say Mr X ,main promoter holding 60 % shares sold 51% of shares to Mr Y in FY 2017-18, then losses carried forward till that year will not be allowed to be carried forward or set off with the profit of the business. The Finance Bill 2017 proposes to amend section 79 of the Income Tax Act to do away with limit of maining 51% shareholding for eligible startups. In other words, even if the total shareholding percentage of original shareholders goes down below 51% , the losses can be set off . The only condition is that the original shareholders should have shareholding ( even if one share) as on last day of the FY in which income is deired to be set off. The benefit is available in respect of losses incourred during the period of seven years begining from the year of incorporation. In coming weeks a detailed posting on carryforward of loss provision u/s 79 shall be published.